This is Little Tibet. 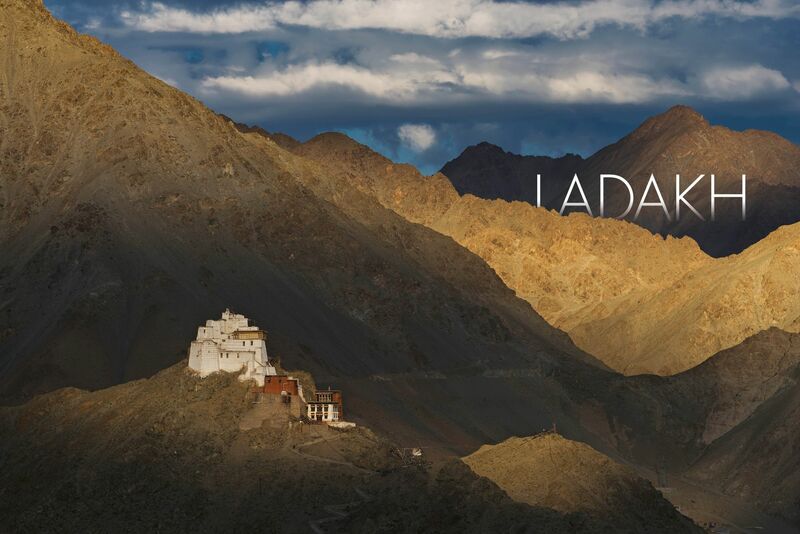 Located in India’s northern state of Jammu and Kashmir, much of Ladakh’s monastic architecture, as well as its culture, is akin to that of its neighbour. Monasteries perch precariously in the foothills of the Kunlun Mountains and majestic Himalayas, while resplendent bodies of water, such as Pangong Lake, sparkle, their crystal depths clear under blue skies. Distinctive high-altitude cold deserts stretch across vast plains, while in the base of the lofty valleys, sand dunes roll, patterned by natural forces. Within this striking landscape, where India, China, and Pakistan meet, ancestral traditions have endured. Ladakhis and nomadic tribes go about their ancient ways relatively untouched by the modern world—the region only opened to tourism in 1974. It is the “land of high passes.” Inhabitants of the Himalayan kingdom’s largest town, Leh, live at 3,500 metres above sea level. The wanderings of nomadic Tibetans take them beyond 4,500 metres. Such are the altitudes that those with lungs more accustomed to sea level will take time to acclimatise, and visitors to Ladakh are encouraged to do little but lie prone for at least the first day. This in itself is a challenge, for outside the windows or beyond the flapping canvas of the yurts lies the kind of dramatic scenery that takes away what breath is left. With visitor numbers on the rise, the time to take in the abiding charm of this magical land is now. GETTING THERE: It takes 90 minutes to fly from New Delhi to Leh, which has one of the world’s highest airports. Be sure to have appropriate medication for altitude sickness at hand and rest for at least 24 hours on arrival. In summer, Ladakh is reachable by road from Manali or Srinagar, and this is the best way to acclimatise gradually. WEATHER: Festivals take place year round and offer visitors a memorable experience. Ladakh is busiest from April, when it starts to warm up. Late September and October are the most picturesque, and by November the temperature starts to drop and snow is expected. Flights can be affected by weather, so bear this in mind if you are on a tight schedule. GETTING AROUND: Most hotels and travel firms can arrange cars, drivers and guides. Ladakh has the world’s highest drivable road, which rises above 5,800 metres between Chisumle and Demchok. Particularly picturesque routes include Leh to Pangong Lake (220 kilometres and about five hours) and Leh to Diskit in the Nubra Valley (120 kilometres and three hours). ELECTRICITY: Electricity across Ladakh is volatile though reliability has improved in Leh in recent years. Rural towns often have no permanent supply and different areas may have access to electricity on different days of the week. Take backup batteries for digital items, particularly when visiting in winter as they run down more quickly in the cold. FOOD: From delicious momos (dumplings) to curried dishes, spicy stewed vegetables, and thukpa (noodle soup), all washed down with yak butter tea, Ladakh offers a wide array of simple but delicious food. Khambir—thick, whole wheat bread—is perfect for dipping in the flavourful stews. WHERE TO STAY: Leh’s Gomang Boutique Hotel is an excellent choice for comfort and hospitality, while Ladakh Sarai’s options range from traditional mud houses to heritage rooms in a 100-year-old restored property. The Ladakh Sarai people have also opened the Hermitage at Pangong, a summer camp of eco-friendly yurts overlooking the stunning lake. Polo is fast and furious and played with hardy local ponies used to the altitude by virtue of living and grazing on high grasslands. Horses are also used by nomadic tribes for transport. Sand dunes roll across part of the Nubra Valley, a highaltitude cold desert that separates Ladakh from the Karakoram mountain range. The Shyok and Nubra rivers meet here, resulting in fertile land that nurtures a range of grains and fruit and is well suited to grazing Bactrian camels and pashmina goats.The goats, also known as changthangi, are famed for their ultra-fine wool, which is used in the coveted scarves to which they lend their name.